Home > Food Facts > Is Lettuce Considered a Fruit or Vegetable? Is Lettuce Considered a Fruit or Vegetable? 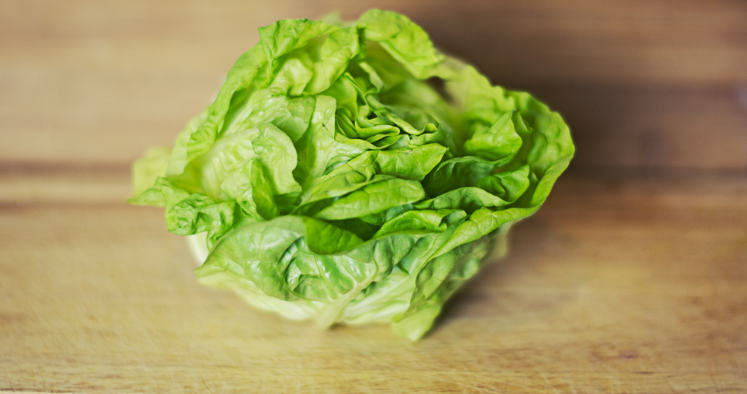 Lettuce is a plant from the daisy family, and it was first cultivated in ancient Egypt to produce oil from its seeds. It is mostly seen in salads and can also be added to soups, sandwiches, and wraps. It is a rich source of vitamins A and K, as well as iron and folate. The types of lettuce include leaf, romaine, iceberg, butterhead, summer crisp, oilseed, and stem. But, is lettuce a vegetable? Let’s find out. Is lettuce considered a vegetable? To know the answer to this, you should know how to classify different foods into fruits and vegetables. Fruit is the mature ovary of a plant. Fruits are produced only after fertilization of the ovules. Considering this definition, squash, tomatoes, pepper, peas, and eggplants fall under the fruit category. Now, there are also fruits that mature without fertilization. These are the seedless varieties of fruits such as bananas and cucumbers. In both cases, as the ovary matures, it enlarges, and the stigmas and anthers wither. Ovules in the fertilized ovaries develop and produce seeds. In unfertilized varieties, the seeds don’t develop, and the size of the ovules remains the same. Vegetables are the edible parts of plants, such as roots, leaves, stem, flowers, bulbs, and tubers. Some examples include spinach, carrot, potato, broccoli, onions, potatoes, and celery. Because lettuce is leafy, it is considered a vegetable. Is iceberg lettuce a vegetable? Yes, it is a low-calorie vegetable which has high amounts of water. Iceberg lettuce is crisp and often used in salads because of its crunchy texture. The other type of lettuce often used in salads for its crunchy texture is romaine lettuce. Is romaine lettuce a vegetable? Yes, it is also a vegetable, and it contains more nutrients than iceberg lettuce. Can You Eat Raw Lettuce? Now that you know that lettuce a vegetable, you should also know how to eat it. You can cook lettuce or eat it raw. Have it as a snack, add it to yogurt, or blend it into smoothies. You can also add lettuce to sandwiches along with other veggies. A lettuce salad containing chicken, fish, eggs, pumpkin seeds, almonds, or kale will be high in proteins. You can also opt for different lettuce varieties. Raw lettuce gives a crunch to salads and can be eaten raw with greens, vegetables, meats, and cheeses. Lettuce stems can also be eaten either raw or cooked. Raw lettuce has many micronutrients, antioxidants, and vitamin C which get destroyed when cooked. Eating raw lettuce or drinking lettuce juice relaxes the mind and induces sleep. Raw lettuce leaves can be used as wraps. It is a healthy alternative to refined flour wraps. Here are seven health benefits of lettuce. Lettuce possesses anti-inflammatory properties. Lettuce extracts are found to be effective against inflammation caused by biocatalysts like lipoxygenase and carrageenan. High cholesterol levels may cause cardiovascular diseases such as heart attacks and strokes. An animal study conducted on mice who were fed lettuce showed that lettuce helps lower cholesterol levels. Lettuce has antioxidants that can combat free radicals in the body. Free radicals are produced during cellular metabolism. They attack healthy cells, tissues, and DNA. Free radicals cause healthy cells to turn into cancer cells. Lettuce latex contains antimicrobial properties. Studies show that Candida albicans and other yeasts become damaged when they come into contact with the latex in lettuce. In Unani medicine, lettuce was used as a sleep inducer. Lettuce contains a chemical which had a sedative effect when administered to animals. It also showed decreased heart rate and ventricular contractions. Neurons are physically connected brain cells that make up our memory. The death of neurons can cause memory loss or Alzheimer’s disease. Lettuce extract can reduce neuron cell death. According to an article published in Oncology Reports, lettuce leaf extracts can control a few types of cancer. Research conducted on breast cancer and leukemia cells showed that lettuce extracts could control these types of cells. Now that you know lettuce is a vegetable, you should make this low-calorie veggie a part of your diet. You should select lettuce with clean, crisp leaves. Be sure to avoid the ones that have withered leaves. “8 Impressive Benefits Of Lettuce,” Organic Facts; https://www.organicfacts.net/health-benefits/vegetable/health-benefits-of-lettuce.html, last accessed April 27, 2017.